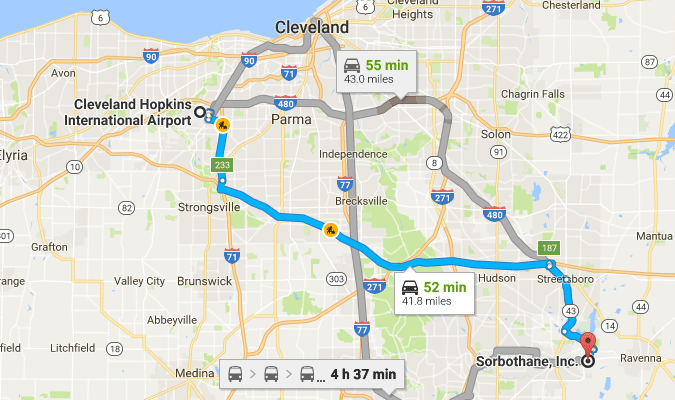 Take Terminal Dr. toward I-71 N.
Take OH-237 N ramp toward I-71 N/I-480/Cleveland. Merge onto I-480 E toward Youngstown. Take OH-14 E exit 21 toward Youngstown. Turn right onto OH-43/State Route 43. Turn left on Fairchild Ave.
Take a right onto N Water St. Left E Main St.
E. Main becomes State Route 59/Oh-59. 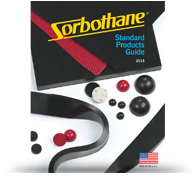 Sorbothane, Inc. is on the right. Merge onto I-480 E & take exit 156 toward Youngstown. Take OH-14 E & get off at exit 21 toward Youngstown. Take a slight right onto Cleveland Rd. Turn right on Wall St. Turn left on Brady Lake Rd. Take a right onto State Route 59/OH-59. 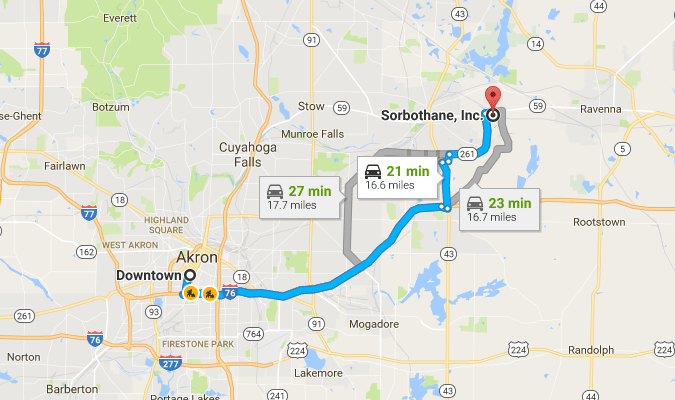 Sorbothane, Inc. is on the left. Merge onto I-76 E Youngstown. Take OH-43 exit 33 to Kent/Hartville. Take a left onto OH-43/State Route 43. Turn right onto State Route 261/OH-261. Turn right onto State Route 59/OH-59. Via I-76 E toward Youngstown. Take OH-43 to exit 33 Kent/Hartville. 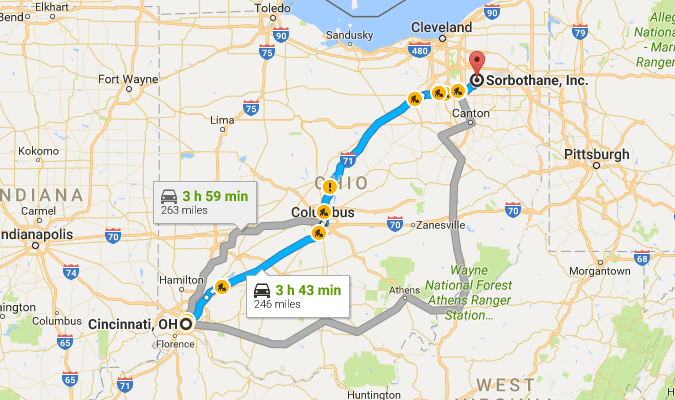 Take a left onto OH-43. Take I-270 N exit 108B toward Cleveland. 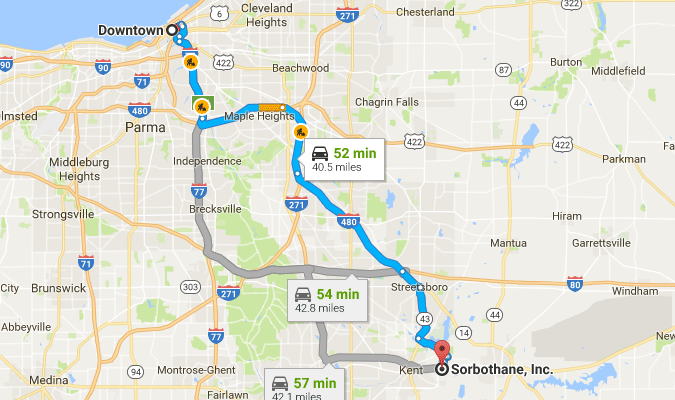 Merge onto I-270 N/Outerbelt N.
Merge onto I-71 N exit 26 toward Cleveland. 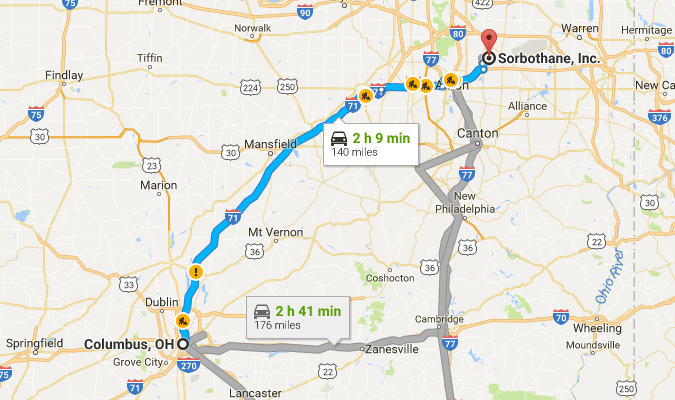 Take I-76/OH-224 exit 209 toward Akron/Lodi. 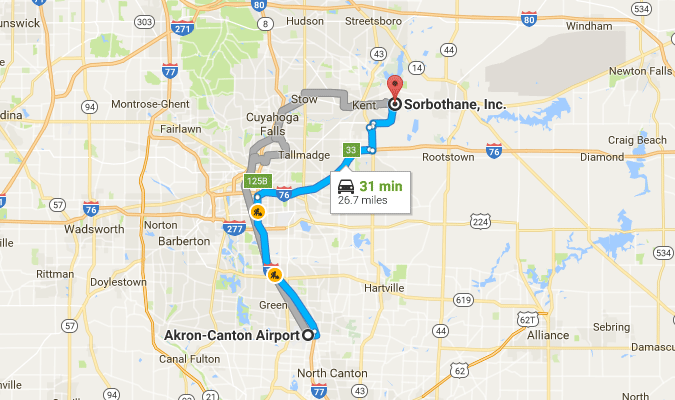 Merge onto 1-76 E & take exit 209A toward Akron. Take OH-43 exit 33 toward Kent/Hartville. Turn left on OH-43/State Route 43. Take I-71 N exit 101A toward Cleveland. Turn right on State Route 261/OH-261.